Richard Feynman said, “What I cannot create, I do not understand.” While the sequence of the human genome has been known for nearly 20 years, many mysteries in life’s recipe book remain to be solved. 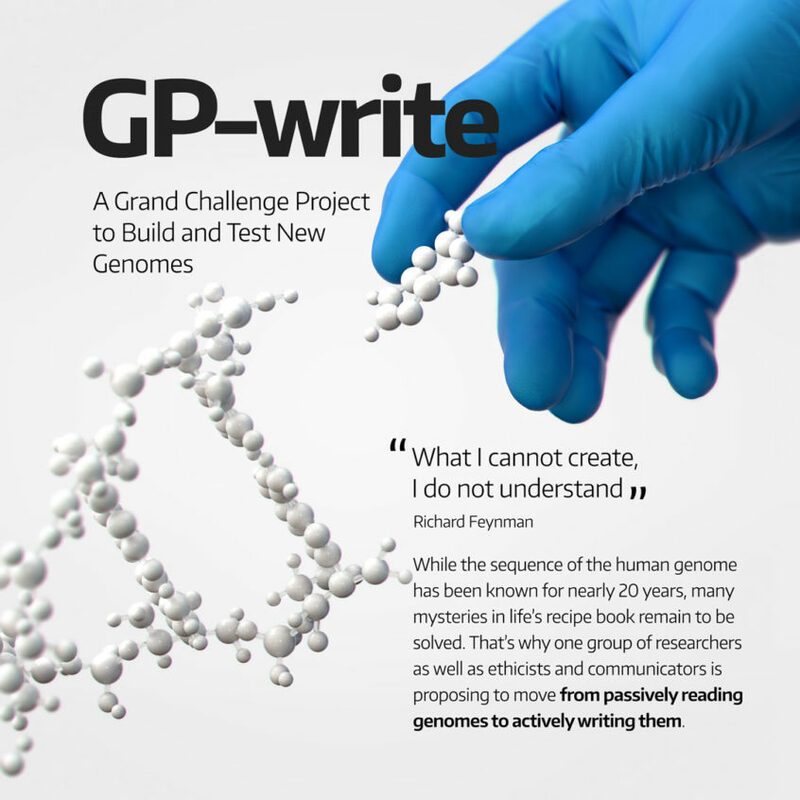 That’s why the leadership of Genome Project-write (GP-write), a project that follows on to the Human Genome Project and involves some 200 scientists from more than 100 institutions in 15 countries, proposes to move from passively reading genomes to actively writing them. At the May 2018 Scientific Working Meeting, GP-write organizers will announce the first community-wide project: “ultra-safe” versions of human cells that resist natural viruses, and potentially radiation, freezing, aging, and cancer. Cells may be rendered virus-proof using a process called recoding. To build proteins, cells use combinations of three DNA bases, called codons, to represent each amino acid building block. For example, the triplet ‘GGC’ represents the amino acid glycine, TTA represents leucine, GTC represents valine, etc. Because there are 64 possible codons but only 20 amino acids, many of the codons are redundant. For example, four codons can each stand for glycine: GGT, GGC, GGA, and GGG. If you replaced a redundant codon in all genes (or ‘recode’ the genes) and removed the tRNA machinery that decodes it, the human cell could still make all of its proteins. But viruses – whose genes would still include the redundant codons and which rely on the host cell machinery to replicate – would not be able to translate their genes into proteins. Viruses trying to replicate would instead get snuffed out – as a result, the recoded cells would be immune. The concept of recoding for viral resistance has already been demonstrated. In 2013, Lajoie and colleagues reported in Science that, by removing all 321 instances of a single codon from the E. coli genome, they could impart resistance to viruses which use that codon.1 An international team, including the lab of professor George Church (founding core faculty member, Wyss Institute at Harvard University and professor of Genetics, Harvard Medical School), is finishing the removal of six more codons from the E. coli genome, requiring a further 62,000 changes. In comparison, the GP-write proposal of an ultra-safe cell line would require at least 400,000 changes to the human genome. Specific redundant codons would have to be removed from all 20,000 human genes. The GP-write organizers hope to complete their work within 10 years. Ultra-safe cells could have a major impact on human health. For example, some medicines are manufactured in specialized cellular factories. Viruses can contaminate the cells, in one case causing an estimated $1 billion in losses, and cutting off patients from their medicine.2 Because of the risk, companies must undertake costly monitoring for viruses. Ultra-safe cells could thus make pharmaceuticals safer, cheaper, and more reliable. And while they are resynthesizing genes, researchers could make the cells safer in other ways, like recoding genes to make the cell less likely to become cancerous, or to resist damage from aging, freezing, and radiation. Recoding human cells will require significant improvements to technology for synthesizing and testing artificial genomes. In gene synthesis, DNA nucleotides are biochemically stitched together one at a time. The result is similar to natural DNA, but the process is currently very slow. By driving innovation and increasing demand, GP-write hopes to make this process faster and cheaper. After synthesis, the DNA can be assembled into genes or entire chromosomes, and then tested in living cells. GP-write scientists will also work to improve the tools for genome assembly and testing, but in some cases, the technology doesn’t exist yet. The ultra-safe cell project will be modeled in part on the success of the Sc2.0 project, led by professor Jef Boeke, Ph.D., director, Institute for Systems Genetics, Department of Biochemistry and Molecular Pharmacology, NYU Langone Medical Center. This year the participants aim to complete the radical rewriting of the 12-million base-pair genome of baker’s yeast. In comparison, the human genome has 3 billion base pairs in one set of chromosomes. The organizers of GP-write believe in proceeding transparently and responsibly. They have sought feedback from bioethicists, policy experts, journalists, and the public. GP-write is coordinated by the Center of Excellence for Engineering Biology. The project can be followed at EngineeringBiologyCenter.org. “Genomically Recoded Organisms Expand Biological Functions.” Mark J. Lajoie, et al. Science, October 18, 2013. “Drug Manufacturing Mending After Questions of Quality.” Jonathan D. Rockoff. The Wall Street Journal, June 11, 2010.